LOOSE AND LEAFY in DORSET: WHAT'S NEW, WHAT'S OLD, WHAT'S YET TO COME - and, most of all - WHAT'S NOW! WHAT'S NEW, WHAT'S OLD, WHAT'S YET TO COME - and, most of all - WHAT'S NOW! I’ve been housekeeping the blog so it should load faster onto your screen. Most links are now under tabs at the top of the page. I’ll soon be adding notes to explain in what ways the different sites might be of use or of interest - though many are clear in themselves. ‘What I Read’ (wide-ranging and idiosyncratic) has been reduced to a short list of blogs with a similar focus to Loose and Leafy. Not that I’d be able to explain my thoughts well here - Lithops, Sri-Lankan Trees and creatures in the National Zoo in Washington DC have very little in common with the hedgerows of south-coast England. Parallels between Loose and Leafy and The Green Man and Rebecca in the Woods may be more obvious. Don’t be put off by the title of ‘Tree Care Tips’. You may not be about to go pruning but I think it will interest all who like trees. Do check on the ‘Related Blogs’ tab from time to time. I’ve lost track of some links. They will be added back in gradually and more added. of because they are so tart). Yet to be included . . . an ‘ABOUT’ tab. Whenever I visit a blog for the first time, I like to know a little about the author and where he or she lives. This ‘where’ thing is very important in a blog like this and I’ve neglected it. I introduce you to trees and plants, bushes and flowers; occasionally I offer glimpses of views; but there’s little real context; the area as a whole; what people do here; how they live. I plan to put this right, partly in posts; partly under a tab. 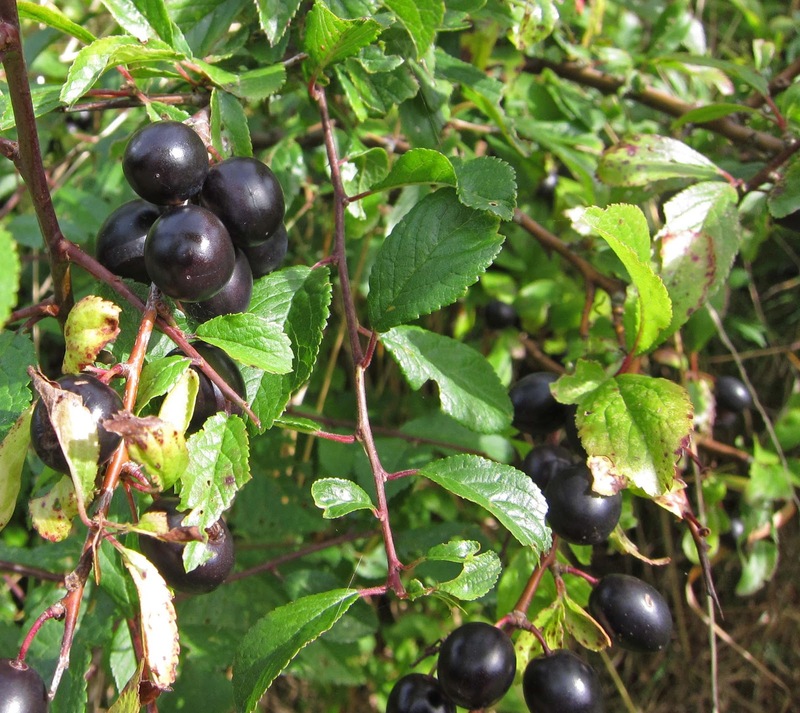 I have noticed two varieties of sloes (Blackthorn fruits) ripening locally in late summer). The ‘ordinary’ kind with a ‘bloom’ on (above) - and shiny ones (on the right). The fruits of Hawthorn are called 'haws' and, unlike sloes, are red. And finally, almost insignificantly - but part of the ‘now’ - at our feet, this . . .
You cant beat a good mixed native Hawthorn and Blackthorn hedge. Not used often enough if you ask me. I also love the folklore surrounding these trees. Wrote a post on this last year if your interested. I too just gave my blog a new look. It still could do with a bit of a spring clean though. You're so right about location being important for nature blogs - with other subjects it doesn't really matter, but if I stumble across a blog with great photos of birds or wildflowers or what have you, my immediate thought is "okay, where in the world is this?" Thanks again for the link! Lucy I like the new blog look and these trees are gorgeous..
What gorgeous flowers! The green fruit can actually be used to achieve a yellow dye on wool. I have been attempting to spring clean my blog as well. After 3 years it has gotten a bit cluttered! Lucy Hi!! Thanks for your comment on the blog. You are so right about the comfrey..because it's not comfrey it's pulmonaria.. silly me ! and thanks so much for the blog link! I could send you a little bee image?? Isn´t the blackthorn just wonderful! This is the first time I have seen it for 8 years! Your post has reminded me of how much I enjoy Sloe Gin. 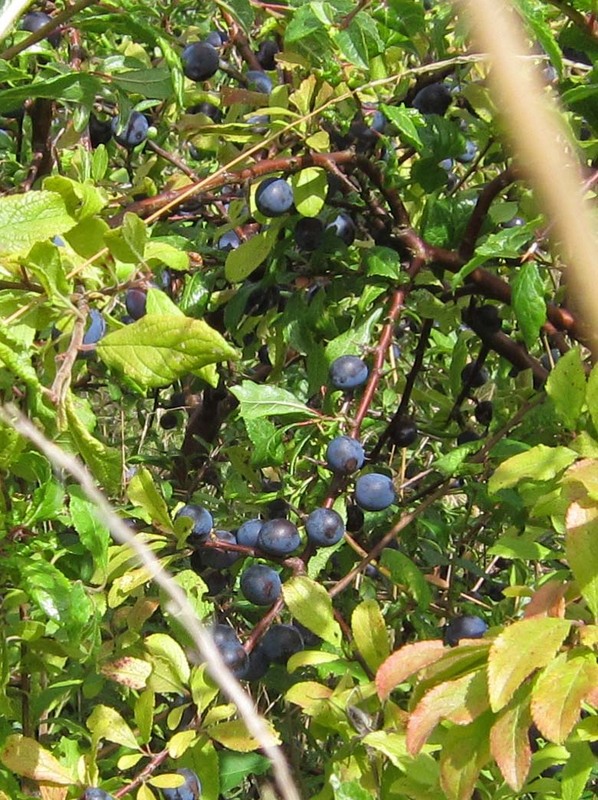 Isn't it funny how sloes only seem to be used for the one purpose? The sturdy Blackthorn wood though is sometimes used for making walking-sticks and shillelaghs. 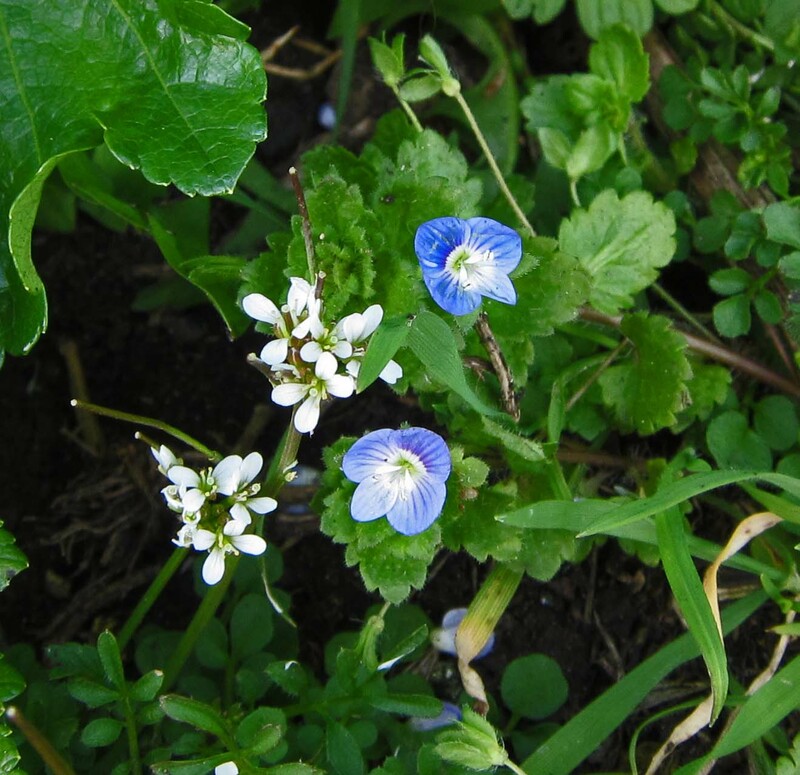 Beautiful photos of the flowers - a real celebration of Spring! Blackthorn is just lovely! I don't there is any around here, just hawthorn. To me, spring is as much about the tiny treasures at our feet as the hedges in full flower. Ali - I've made a few more changes since you visited. The dark green background for the tabs was a bit too stark. A few more tinkerings needed yet, I think, but getting there! I wanted to tighten things up but don't want the blog to look so different readers wonder where they are! Stone Art I like the new look of your blog too. A more noticeable change, perhaps, than on mine - and all the better for it! Thanks for endorsing the idea of doing more about context Rebecca. I live in such a beautiful area I am always worried it might look a bit like a tourist site if I showed the wider shots! Hi Donna. The trees are, indeed, lovely. I was walking in an area exposed to high and cold winds yesterday and the blackthorn blossoms were noticeably smaller - though just as profuse. Hello Cynthia. I'm now wishing I needed to dye some wool! Hello Val. I imagine the part of the USA you have been living in is too hot and dry for Blackthorn - or have I got the climate there wrong? Mark - not good to be in possession of a shillelagh after drinking sloe gin! Phoenix C - I've drunk sloe gin only once and I liked it. It is thick and sweet and tasty - a liqueur I suppose. I'm not much up on things alcoholic but I'd guess it is the kind of drink it would be best not to have too many top ups of - however tempted. Hello Mr McGregor's daughter. Spring is odd round here - there are flowers up and flowers down but not yet many wild ones in the middle. Very beautiful post! Thanks for sharing your thoughts!!!! Hello Vicky. I'm pleased you enjoyed the post - and hope you visit again! Your blog is very organized! I always enjoy a visit here. I cannot believe I have never managed to see a Blackthorn bush - unless I have and thought it was something else. On second thoughts those thorns are a bit of a give away. Either I am unobservant or there are no Blackthorn bushes locally. I'm guessing I am the one at fault. I like the changes you have made. Great photos, too! I always want to know where someone is when I read blogs - not just garden blogs, but all kinds. Thanks for following my blog. I like first & last pictures most. Blackthorn is lovely tree and resembles Sakura, cherry flowers. Some of Sakura species burst into bloom before leaves bud. 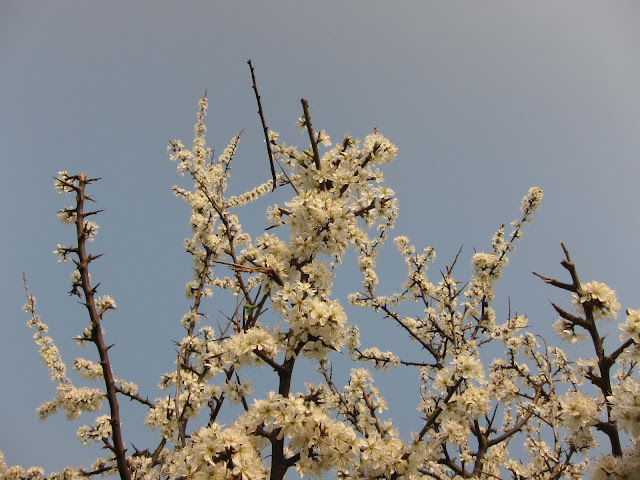 Blackthorn may be an usher of spring in your counry like Sakura in Japan? Thank you for sharing! I do love the fluffy white clouds of blackthorn blossom, even if it does conceal some of the most vicious thorns around. I have totally failed to do my "hedge watch" project, though I am loving watching it as I go too and from the plot. Good housekeeping - it does indeed load a lot faster! Hello Rosie. 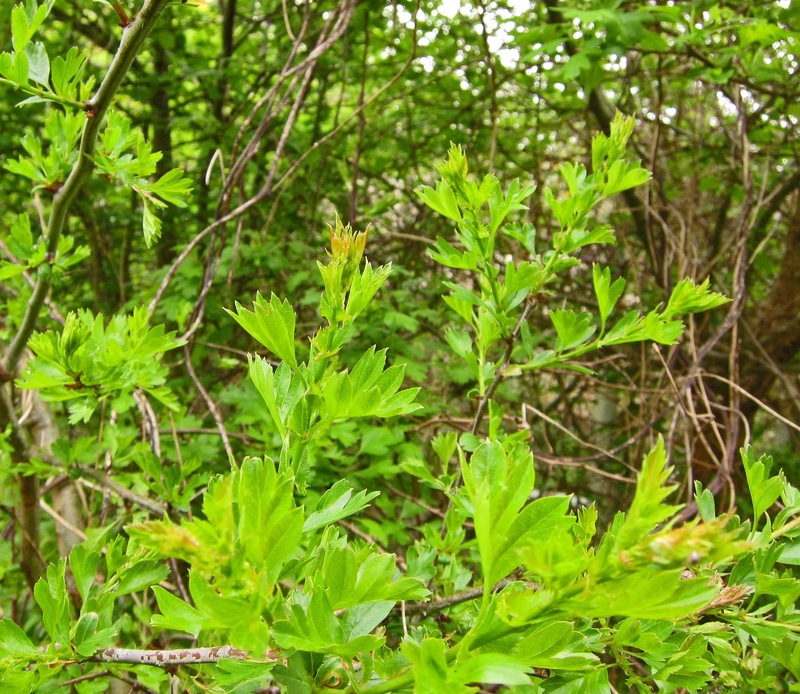 When I went to look, a few days ago, the hawthorn buds were growing large enough to photograph. Hello John. I think I would get confused if I called 'Blackthorn' 'Whitethorn'! Mainly because most hawthorn is white too. (Some is a garish deep pink.) I've not tried eating a haw - though I have read that the leaves are good for stomach complaints. Hello Easygardener. I don't imagine many people grow blackthorn in gardens but you can often see its blossoms in the hedges of fields if you take a train journey through the countryside at this time of year. Hello Barbee - glad you like the changes. Hello Colleen - wild plum gin! Where do you collect your plums? Surely not in the East End? Hello Shifan - don't forget to let me know if you would like a picture beside your link. Hello Snowwhite - for me, hawthorn is an even greater sign of spring than blackthorn is. Because it comes later, the weather is warmer. 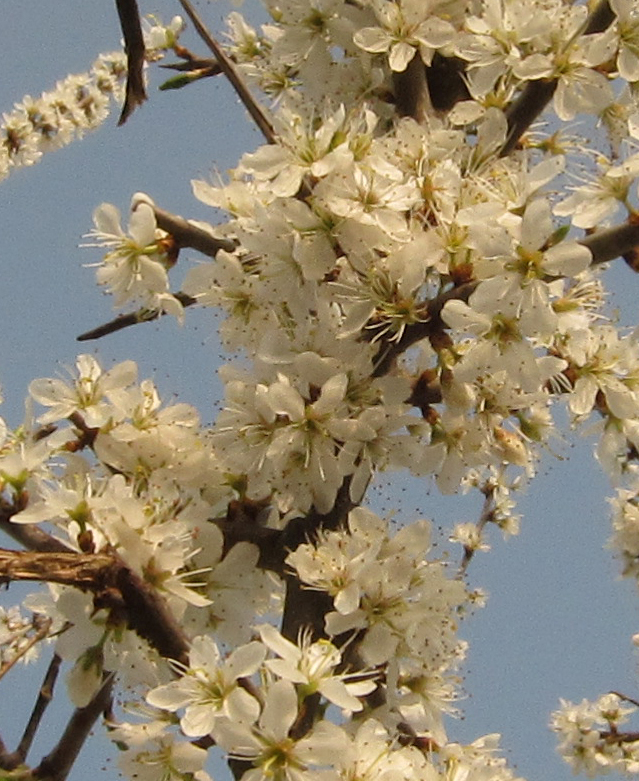 Blackthorn is prettier (I reckon) and I like it better than hawthorn - but cold weather is one of its companions. Hello Janet. I understand the thorns of Blackthorn could be used as needles for 78rpm records! I'm glad the blog loads faster now. I'm sorry to take so long to twig it could be slow! If you (or anyone) notice any other such problems, please do say - it's better to sort things than to inconvenience readers. Hello Catmint. It's true; blogs have to change as they evolve and as new features are added - the option to include tabs is comparatively new. Happy Spring! Thank you for all your comments, everyone. You may like to know the next post is now published. It's about what Weymouth - the largest town in this part of Dorset - is like. Hopefully, it will give a little bit of context. I'm always on the lookout for blackthorn - I think the next week or so will probably be the best time for me to pin point these trees before the hawthorn flowers - but our spring has everything flowering out of sink just now with all of this glorious weather.